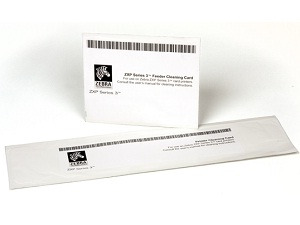 The Zebra ZXP Series Cleaning Kit (Item #: 105999-302) has been designed to clean your Zebra ZXP Series 1 or ZXP Series 3 ID card printer. This cleaning kit includes 4 print engine cleaning cards and 4 feeder cleaning cards. Cleaning your card printer is critical to ensure optimal printer performance and superior print quality. Running a cleaning cycle on a regular basis will extend the life of your printer and improve the readability of printed cards. It is recommended to clean your printer with every 1,000 cards. Genuine Zebra supplies meet stringent quality standards and are recommended for optimal printing quality and proper printer performance.